How to Write a Validation Protocol? Learn how to create a validation protocol and its different parts for the pharmaceutical. A protocol is a written statement to conduct the validation process along with the procedure, test method, equipment handling, specifications, acceptance criteria, report and approval. 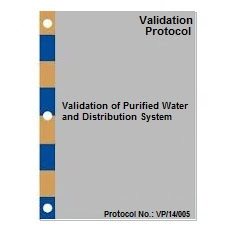 Validation protocol must be written before carrying out a validation activity. It should be prepared by the qualified person of the concerned department and should be approved before the implementation. This document shall help to create a new validation protocol for the validation activities in different departments of the pharmaceutical company. A validation protocol should contain (but not limited to) following parts. 1. Protocol approval: Protocol should be reviewed by the head of the concerned department and approved by the head of the quality assurance. 2. Objective: The aim of the validation study should be written with the objective of the validation protocol. 3. Scope: The area of the validation where the protocol will be applicable. Specific department and its area with the protocol is concerned. 4. Reason for validation: The reason behind the validation due to which the validation of process or method is being done. If the product or method is new then the “New Product” or “New Method” should be written. 5. Revalidation criteria: The situation in which we shall re-validate the process should be mentioned. 6. Responsibilities: Responsibilities of each department involved in the validation activity should be defined. 7. Reference documents: The documents those are used to complete the validation activity as specifications, standard operating procedures, BMR, BPR, method of analysis, other protocols etc. should be mentioned. 8. Procedure: How validation activity will be carried out during the process, should be written. It should also contain the operating procedures of equipment, sampling procedures, sampling time, sample quantity, analysis method, calculations, etc. 9. Deviations: All the deviations from the written procedure happened during the whole validation activity should be written. Any deviation happened should be closed before the completion of validation activity. 10. Conclusions: Validation activity should be concluded. Overall results of the validation indicating if validation passes or fails should be written in conclusion. 11. Report: Reports including the raw data should be attached as annexure. Data should be compiled by the qualified person of the concerned department and should be checked by the reviewer. 12. Report Approval: Reports should be reviewed by concerned departments and approved by the head of quality assurance. Report approval shows that the validation was completed successfully and according to the validation protocol. this is eswar. iam wokrking in pharma company .in manufacturing .your articales are very useful to me and i learn new things . How to decide check point during OQ & PQ? ?